I ended my 1st ever 25 Motif Challenge with a free pattern & am starting/continuing the next round with another free snowflake pattern. This time, though, it is my very own pattern, right from scratch ! Not derived or adapted. Nothing really new about the elements, but it’s a big start for me. Back in late June, I tried my hand at needle tatting. And I realized how easy it was to design with needle tatting because one could easily unravel & redo any element … no need to cut & discard, etc., just go with the flow. That’s how I created a pendant. However, when I tried to convert that into shuttle tatting, I faced a problem & the pendant started to turn into a circle (story of my tatting life!). Easy conversion is possible Only if the needle, thread, & shuttle conform to the same size. I used a needle that was suitable for size 10 or thicker thread, but converting the pattern into a size 20 shuttle pattern required major shifts in stitchcount. It is a 2-shuttle pattern that can be done in one pass, using 1 or 2 colours, or as separate rounds. No stiffening or blocking required, since the 3rd round creates a relatively stiff ‘border’, keeping the shape intact. pds – padded ds (2 wraps); also called dds, spds, BDS, etc. Composed of 2 sets of alternating trefoils, chains, & Josephine knots. A Split Ring will be required to move out of this round, if you want to make it in one pass. SR : 3 + 8 / 3 + 8. If you want to start the next round afresh, then make this a normal ring (3 + 8 – 8 + 3), tie & hide ends. TIP : Keep the joining picots Within the trefoil rings small (as indicated in pic), if you want the rings to broaden/stretch out. If the picots are long, the shape of the rings will be more spindle-like. (or Lock join if preferred). No Reverse Work, but Switch Shuttles to make the thrown ring (JR). Ch : 1, vvsp, 12, S&R join to picot where 2 trefoils meet. Ch : 12, vvsp, 1, JR8, 1, vvsp, 12, S&R join. Continue around repeating from ** till 1st JR reached. Join with Lock Join to base. If desired, one can end here. It makes a nice flower shape with 6 petals ! 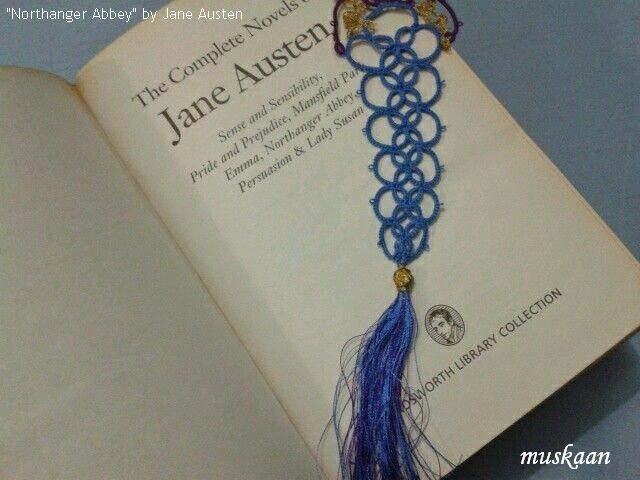 Consists of chains only, that are made up of Victorian sets/Node tatting, & padded tatting. For the pattern, you may need to add or reduce a couple of hs, depending on your own tension. The objective is for the node tatting chains to lie niched against/just adjacent to the previous round chains. Joins : While I prefer Slope & Roll joins, it can be substituted with a Lock join. Switch shuttles (if using 2 colours). Make a lock join to the vvsp on the left of JK of previous round. Repeat from ** to ** till you reach starting point. Tie & cut. Hide ends. Or cut a longer length to make string/loop for hanging. I ran out of Sh1 thread midways through the last round. So, if tatting in size 20, you can easily load/reload accordingly. please let me know through comment or email (on my profile). Happy Holidays & a Great 2015 ! But I’d much rather talk about inspiration ! Inspiration not from within, but from all you awesome tatters & designers, and all your fun projects that you keep sharing. I finally dropped my crochet hook yesterday & picked up my shuttles – I just Had to, despite my resolution to tat tree ornaments, etc. only in the next season. And despite the fact that I really am enjoying my crochet afghan. I used 2 shuttles, in order to climb out of the central ring using a mock picot & Split Ring, and hence accomplishing the snowflake in one round. This is a fairly simple pattern & can be done with shuttle & ball too. If using only single shuttle, the central ring & adjoining split ring can be done as Single Shuttle Split Rings ! Or for absolute beginners, make the central ring separately, tie, cut. Start Round 2. I used Red Heart Size 20 in white. However, the size 20 seemed more like size 30, & it is stiffer than Anchor Mercer – ideal for snowflakes ! – – where next repeat is joined to previous one. Note : Reverse work after each ring & chain, if not following frontside/backside tatting. Repeat from ** 5 times, joining as one goes, so that one has 6 ‘sides’. Join the last repeat to the 1st one before finishing off. Tie & cut ends & hide. Basic stitch-count has been inked in pic below; red denotes rings & blue denotes chains. This snowflake can also be used as a hexagonal motif, joined together for larger projects. My thanks to Kersti, for sharing the pattern . I 'designed' another snowflake yesterday, but need to do it in white today. Will share pattern as soon as possible. 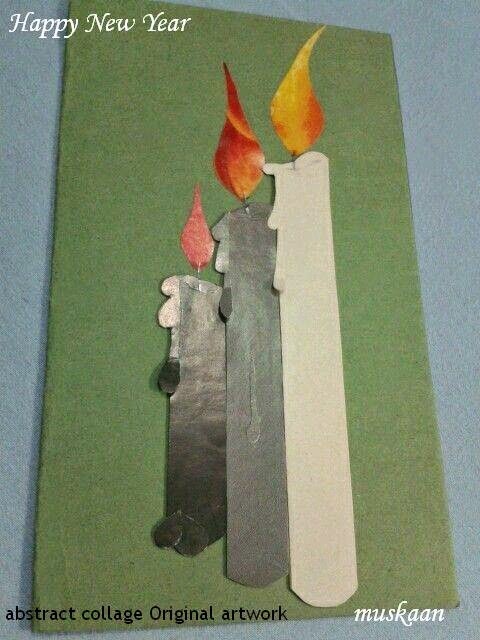 The collage candles, my original artwork, has a symbolic message/wish conveyed through the size of candles, their relative placement, & their colours, as well as the intensity of the flames. If the past was black & the present bleak, the future will be very bright. The past is forgotten, the present is waning away, the future is looking brightly ahead. Or the past & present are/will become shining or treasured memories that will remain alive in us (as reflected by the flames). Shadows have not been added, because the black & grey candles (past & present) themselves act as a shadow to our life ahead. 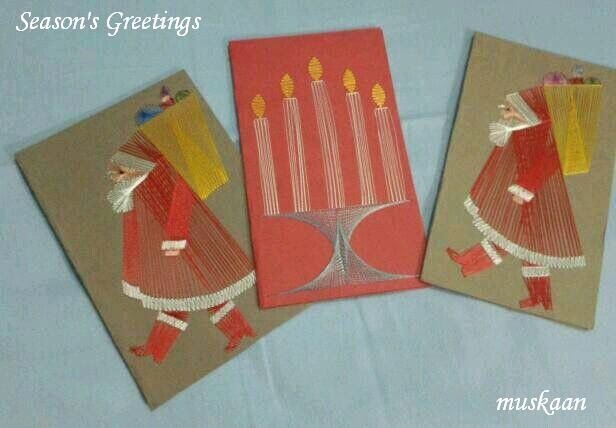 I've used some sort of glossy paper for the candles & thin glossy magazine paper for flames [recycled]. In order to give it depth/3-dimension, the molten wax has not been glued down completely, & the candles themselves are glued over a thicker layer of paper. The telltale shadowy lines indicate the raised candles. The string art on paper patterns have been taken from a book, the title of which I do not have. If somebody knows, I would appreciate you sharing the info so that due credit can be given ... These were made back in the late 80's, so the book predates that. It was a hardbound coffee-table kind of book with loads of lovely patterns, kindly lent by a friend. Don’t you just hate to count stitches in a knitting project - & there is a Lot of counting right from casting on to patterning to shaping to customizing ….. Markers help you keep track of short segments so that you do not have to count All the stitches All the time !!! Whether one is just starting out, or is well-experienced, markers always come in handy at various stages & in all types of knitting. I have tried to capture & list these instances, while knitting this top/blouse last season . Note, however, that one does not need to use a marker for every little thing – my intention is merely to highlight as many possible uses as I could think of . When one has to cast on a large project, or one is working with thin yarn, the number of stitches to cast on goes up. Equidistantly placed markers are very handy to keep count ! I insert a marker after every 20 stitches while casting on, so that one does not have to go back & count from the beginning each time (this project required around 120 sts for border). No more fear of losing count due to distractions, etc. After the ribbed border, in a sweater/pullover, one is frequently asked to increase the number of stitches before starting on the pattern for main body. These increases need to be spread out evenly throughout the border, for an even, clean look. Markers make it easy to calculate & space out these increases, without having to keep constant count. You can divide the increases between each segment delineated by markers & simply check whether each segment has the required increases. A pattern is made up of many repeats along the length of the knitting. So once the border is knit, & the stitches are increased, one can count the number of stitches for each pattern repeat & relocate the markers accordingly. This can be done as one is knitting on the 1st row of the pattern. I have used 2 different patterns (alternating with each other) in this example. One requires 23 sts, while the other 6. Hence the markers (represented by comma) are placed in this sequence : 6,23,6,23,6, & so on till entire length. After a few rows have been knit, & the pattern has been repeated over the rows a couple of times at least, it becomes easy to track the next rows. Firstly, one has memorized the pattern by now, & secondly, the previous rows act as a visual guide. At this time, one can do away with the markers in step #3 if desired. However, if one is watching the tele, or chatting, or there are other distractions, it might be a good idea to keep the markers in place so as to keep track of the knitting at all times. It acts as a double-check to reduce errors by immediate spotting & rectification. I forgot to take pictures later - so engrossed in knitting ?! Hope the explanation suffices. Markers can be placed along the side - at the start of a new repeat of pattern, or after a given number of rows. Eg. after every 10 rows. This helps to keep track of the number of rows already knit, without having to count each & every stitch/row vertically ! My general rule of thumb is 10 rows. In my blouse, these markers remained very useful for another reason : the 23-st segment is a 6-row repeat pattern, while the 6-st segment requires only 4 rows to complete ! Markers at the start of rows help in another important way : When one is shaping the chest by increasing a stitch from waist upwards, the row where one increases, can be marked. This will come in handy when one starts knitting the other side (front or back); easy to track where an increase has occurred & repeat it. This keeps the increases on both the front & back of a sweater even & identical And when the time comes to sew the 2 sides together, the seam is very neat & even! TIP : I use markers in a different colour, for the increased stitch rows. How often does it happen that one has to suddenly pause knitting & attend to some other life matters ? While I prefer to complete the row & then pause, it is not always possible. Sometimes one has to leave knitting mid-way through a row. 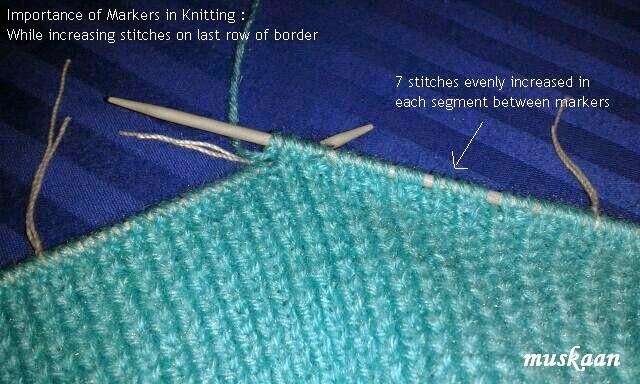 In such cases, markers are of tremendous help – simply complete knitting the few stitches upto the next marker (i.e. complete the segment only, instead of entire row) & attend to the call. It is then so easy to re-start without having to use precious brain cells trying to figure out where to start …. This is especially true of lacy patterns. Dropping or decreasing stitches is called for while shaping the armholes, neck, etc. So, just as markers prove to be good guides while increasing, these can be equally helpful while decreasing. In case of lacy patterns, one can adjust the decrease based on markers, keeping the pattern as evenly shaped as possible. TIP : Shaping is required while knitting Socks, too. Markers can come in handy when increases and decreases are made. When one is knitting in the round, with circular needles or open needles, a marker is vital to indicate the start of the row. In conlusion, markers help to calculate stitches in casting on, in calculating stitches & placement for shaping (I like visual cues), keep track of knitting pattern & minimize errors. I do not have any store-bought markers. Instead I simply use scraps of wool or thread. I have found crochet mercer thread to be Ideal. It does not fray easily, is thick enough to be clearly visible (unlike sewing thread), yet not so thick as to leave a space between stitches. It is also something that can be found in the home itself. Take a short length of thread & tie a slip knot. This is nothing new to those who crochet & knit - one has to start with a slip knot. If not, click on the highlighted term or here for many tutorial links on Google. If desired, one can make a permanent solid, immovable knot. I prefer slip knot because the loop size can be easily altered & adjusted whenever desired, by simply pulling on one loose end. Hence, these markers can be used on any size needle ! Secondly, if at any point I want to remove a marker midways, all I have to do is pull on the loop & the knot opens up completely & the thread can be slipped off anywhere, anytime ! No need to cut with scissors & risk cutting the yarn. Make many such markers beforehand, so that while you are occupied with your knitting needles, all you have to do is pick up one of these already-made markers & slip it on the needle. Since it is a slip knot, it can be tightened as much as desired. However, it is preferable to keep it slightly loose so that switching it between needles becomes easy. While one is knitting, these markers are not knit. They are simply slipped on to the other needle. What has been your experience ? Please share …. Mea culpa. I take full blame. Some novels, some authors, some author’s novels are Not meant to be read back to back! I am talking about Jane Austen’s “Mansfield Park” (1814) & “Northanger Abbey” (1817, although first given to publish in 1803!). Both are coming-of-age stories of 2 young naïve girls. When I started, I realized that I’d read (And watched) it before, but continued nonetheless, because details were largely forgotten. The protagonist was a bit depressing, but overall, the story worked out satisfactorily. The end, though, was very abrupt …. as if the author ran out of time, space, ideas, patience, or whatever. Kind of reminded me of Yash Chopra’s films that start off well enough, with lots of romantic twists & turns, but then come to such an abrupt, unconvincing “Huh, what the ….? !” end ! Stopped watching them, too. orthanger Abbey – to me the only redeeming feature was it’s underlying sense of sarcasm & humor, a story in a lighter vein, despite the frequent “vexations”. But I could Not connect with the heroine & the narration was not engaging enough (with some proselytizing about novels & their effect/impact on young minds). Maybe if I hadn’t read it immediately after finishing Mansfield Park, I might have found it a bit more pleasing, although her gothic fears were a bit over-the-top. It did, however, remind me of a neighbour we once had. This young teenager was so addicted to RL Stine books (horror fiction stories) that she would wake up screaming at night ! So, maybe if I was younger, I might have appreciated the story/heroine more? I enjoyed horror back then. When you read independent, unrelated, non-serialized stories by the same author, in immediate succession, you discover many similarities & repetitions, which might not have been apparent if reading is spaced out (unless one has an eidetic memory). Back to back reading tends to highlight some “weaknesses” in a writer, which would’ve gone unnoticed by a casual reader. It is a difficult act to pull off with aplomb (although some authors are successful - will talk about such an experience in a future post). Speaking of these 2 novels, the setting, the basic characters, the supporting characters, their basic personalities, their value systems, their backgrounds, the professions, their state & status in life & in family, etc. etc. were so very similar ! It felt like the writer had a good thing going with the character-building for one story & used the very same framework for the other. While Northanger Abbey was written earlier (with some alterations later), but since I read it After Mansfield Park, I found it quite a drag to finish – had to force myself to get through it. Again, my impressions may be more biased because of the sequence & timing of reading than actual merits of each story. There could also have been some fatigue in reading about the same period, & same circumstances, & similar romances. But it is as it is. I did want to read “Emma” again (been a looong time); but I am firmly decided on waiting at least One year before taking it up. Meanwhile, on to some serious reading – too much mushiness, despite a sweet tooth, is not good for my health ;-). Disclaimer: These are my personal impressions, not a formal or literary critique, & in no way discount the immense talent of the writer. It is easy to criticize, but so difficult to actually write ! I’ve wanted to share my thoughts for over a year, now. However, it just wasn’t ‘taking shape’ – not a cogent one… And since that time, I have added some more tatting to it. Also, I now see SO Many Gorgeous tree ornaments (balls/baubles) with edgings around the circumference. Haven’t tried it myself, but what I am delineating below should logically come in handy if one wants to use a straight edging over a globe! In fact, using these simple tweaks, one can cover the entire ball with repeats of the edging Only ! Still not happy with the post, but have finally decided it’s time to reduce the backlog. In my very first blogpost here, I had described a few simple ways to create corners for straight edgings. Those edgings were used on square cushion/throw covers. But for the center, I decided to go ‘round’ & coaxed some more edgings/patterns into circles. This post describes that ‘encircling’, how to create a circular edging out of a straight one. A few very simple & basic tweaks required ; no grand designing. Just another 101 beginners’ post. 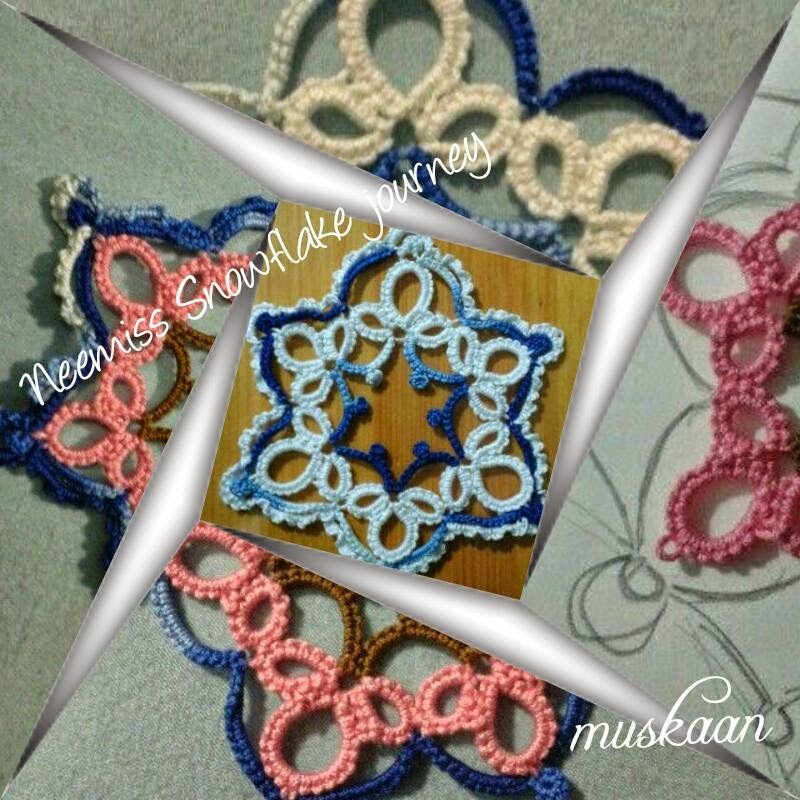 All tatting & crochet is done in Anchor Mercerized Crochet Cotton, Size 20. By merely adding & subtracting a few stitches at strategic places along the edging, it can be converted into a circle ! This is the method used in Down the Garden Path bookmark pattern (by Pam Palmer) to modify it. Chains that were on the outer side needed a few extra ds, while the chains that were on the inner side needed a few ds less, thus causing the curve. A mere 1-2 ds can make a difference. The number of stitches to add or subtract will depend on how large or small the circle needs to be. For a more compact circle, add more ds on outer edge & decrease more ds on inner edge. For a larger circle, with a gradual curve (as the one I made), I had to add/subtract only 2 ds on only a few spaced-out chains. TIP : Keep the additions/deletions spaced or spread out. Clustering the alterations together may cause then ruffling & crumpling, or may change the essence of the pattern. UPDATE : Jane McLellan has just used this tweak to great effect here ! When I first saw Jo's Crochet Flower Garden on pinterest, I quite liked the possibilities of this simple freeform crochet. For a more compact & "flourishing" look, however, I reduced the length of the stem and increased the number & size of leaves & flowers, to get an even more varied & natural look. The leaves can be modified by changing the number of stitches (length) &/or the size of the stitches (width). Changing freeform is obviously easier than a regular/symmetrical pattern. Sometimes, simply by making the joining picots very small, a straight line can curve. Of course, the position of these picots would be important too. 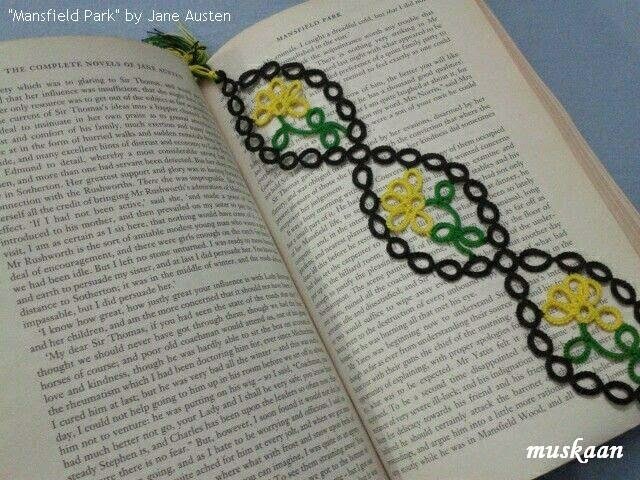 Here is Kersti’s Jessica bookmark (the initial row only) where I made the joining picots really small. Lo & behold, I had myself a small circlet ideal for a medallion, a sun-catcher, or a coaster! All that is required is to fill in the centre space with some nice tatted motif or fabric; or use as applique sewn on to some fabric. Now, if the same joining picots are increased in length, the curvature will be in the reverse direction !!! UPDATE : Extreme encircling of the above edging, resulting in this beautiful Jessica Snowflake, here. These concentric circles are made with the same pattern but joining picot lengths have been altered just a bit. This is a naturally curving edging, so manipulating the circumference with the picot length was easily accomplished. If the joining picot is very small, the circle will become compact (inner circle). In case of normal sized joining picots, I got the larger outer circle. The Green Kaftan neckline is broadly U-shaped. Hence the edging needs to have both curved & linear segments. I tried to achieve this with the help of variable picot lengths. There are 2 joining points (picots) in this edging. The joining picots along the peripheral rings are what matter most ! Although, a slight tweaking along the adjacent clover joins might also help to keep the lace lie flat. For the curved part, I decreased the picot length of the peripheral ring joins. For the straight segment, I increased the picot length, such that the 2 outer rings spanned the same distance as the clover. TIP : Joining picot lengths can work both ways (just like the chains above). In all above examples, I wanted a concave curvature, hence the picot lengths were decreased. If, however, one wishes for a convex curvature, increase the picot join lengths . It will invert the position of the 2 edges of any lace ! This can work beautifully with the oval edging, where there are 2 joining picots. One can “invert” the edging to work either way ! So you get 2 edging patterns from the very same pattern, simply by tweaking the joining picot lengths ! I haven’t tried this myself yet, but it is a clear possibility. It may require some reworking to get the required curvature. One also needs to be mindful of the fact that the pattern might change a bit. Hence, this technique is a bit above the beginner level, but very much doable…a 1 or 2 ds shift might not even be obvious. Would love to hear your perspective, experience & feedback. It was difficult to capture the entire kaftan on camera ; hence the folds, etc. When I first stitched this kaftan & sewed on the store-bought lace along the sides, the neck looked quite barren & needed something. (as seen in the penultimate image). Hence, tatted up a single-shuttle, rings-only edging that I like. It does not exactly go with the triangular peaks of the side lace, but I did not want to take away focus from the side laces. The final result didn’t turn out that bad. I used size 20 Anchor Mercer Black thread for tatting. I don’t have the exact source of this edging pattern (it is one from my old collection), but in an earlier post I called it “Dancing Clovers”. For this kaftan, I deliberately cut off some inches from the side of the fabric, in order to shorten the width. Despite a beautiful drape of entire width, the long ‘sleeves’ snag at door knobs ! The lace lost some of its appeal if nichéd along the very edge. The short green strip gave a much better appreciation of this beautiful lace. And, the extra fabric was folded & seamed in After sewing on the lace, such that the sewing line of the latter was completely hidden within. Another alteration I made was to inner stitching line. Instead of keeping it straight throughout, I gradually went in towards the waist & back out. Unexpectedly, this has created such a lovely shape, that even though a backing was added at the waist for string/belt (the parallel sewing lines are visible in pic above, shown by white arrow), it is No Longer required ! The kaftan drapes so well Without any gathering at the waist ! And since the neck is broad enough, it is easy to slip on. Ending with a pic of how I sewed on the "Dancing Clovers" edging to the already-sewn neck line, using an embroidery hoop. Winters mean shifting to wool ! True to form, I have picked up my wool stash to make my 4th afghan. Except that this time it is a crochet one, not knit. It is a 3-round motif pattern, joining as you go. The 2nd round in each motif is white in the original pattern, but I decided to let my fancy choose a different colour for the 2nd round instead of only white. A great stash-buster project ! Brands include both baby wool & normal wool from Vardhman, Wendy's, Jaypee's, and some odds & ends that I have forgotten. With this range of yarn, it is turning out to be quite a Memory Quilt ! I have been able to use up bits of wool left over from projects completed down the years ... including some that have long since been discarded or gifted . I have used Crochet hook # 9 (3.50 mm) because this could tackle all wool sizes. Thoroughly enjoyable though a whole lot of ends need to be hidden ; hence the tapestry needle & scissors are a constant companion. I am hiding the ends after each round – better now than a mountain-load later ! Also, as the blanket gets larger, I might start a separate piece & join it to the first piece later. It is easier to handle smaller pieces, and also keeps the project from getting dirty. It is such fun to choose colours & placement. I wish I had even more shades & colours …. Love the warmth & coziness of colours during the grey winter days. I am planning to crochet a black border in the end …. I think it would bring the whole thing together, especially since so many colours have been randomly used. Need to figure out some pattern/edging … Any ideas ?